I've blogged quite a few times about John Barclay's book Paul and the Gift. I've generally focused upon the social implications of grace as described by Barclay. Today I want to focus on something different. To recap, Barclay argues that grace has been "perfected" in various ways. If God is the perfect Giver then God gives perfect gifts. But what does a perfect gift look like? Grace is "perfected" if it is lavish and extravagant. Grace is "perfected" if it flows out of a spirit of benevolence and goodness. Grace is "perfected" if it is unprompted, free, spontaneous and initiated solely by choice of the giver. Grace is "perfected" if it ignores the worth or merit of the recipient. Grace is "perfected" if it accomplishes what it intends to do. Grace is "perfected" if it escapes repayment and reciprocity, if it cannot be paid back or returned. Barclay's argument is that Paul's message of grace was primarily about the incongruity of grace. Grace is grace because it is a gift given to the unworthy. That seems banal to us, but Barclay points out that this was, in Paul's time and place, a radical notion. In the Roman first century context perfect gifts were gifts given to worthy recipients. Paul's gospel blew that idea out of the water and forever changed how we think of grace. Today it's a truism that grace is given to people who don't deserve it. That's what makes grace grace. The part of Barclay's analysis that I've mostly focused upon is how Paul uses the incongruity of grace to dismantle cultures of honor and shame. Grace destroys cultural and human standards of worth and value. Grace was a social revolution that allowed honored and shamed to form new, socially transgressive communities. But the point I'd like to talk about today is the perfection of non-circularity. Non-circularity is the idea that grace cannot be repaid, that grace escapes the obligations of reciprocity. Grace is grace because we cannot pay it back. And if we could pay it back, it would no longer be grace, no longer be a gift. Like the perfection of incongruity, this perfection of grace was foreign to Paul's world. Gifts were given in the ancient world precisely to create bonds of reciprocity and obligation. These bonds of obligation were what made the ancient gift economies work. True, elaborate cultural rituals were in place to obscure this fact--it would be crude and improper to try to repay the gift immediately and directly--but bonds of obligation were created by ancient patronage. Favors were cashed in. So the notion that grace escapes repayment is new and strange. And yet, that's an assumption we have about grace. Where did it come from? As Barclay recaps the story, the perfection of non-circularity emerged from the fires of theological debate in church history. Augustine vs. Pelagius. Luther vs. Erasmus. Calvin vs. Arminius. At the heart of these debates was the amount of human participation required in salvation. As the debates were waged, the Augustinian, Lutheran and Calvinistic camps perfected the non-circularity of grace. Grace was 100% the work and initiative of God. Humans cannot repay grace. They shouldn't even try. If we tried to repay grace we'd destroy it. We'd be trying to earn grace, trapping ourselves in a works-based righteousness. And so the assumption took hold. Grace escapes repayment. And yet, if you read Paul, that conclusion seems off. And that's the point that Barclay makes. Paul didn't perfect non-circularity. Theologians did, and we do, but Paul didn't. According to Barclay, Paul most definitely felt that grace should be repaid, that grace created bonds of obligation. 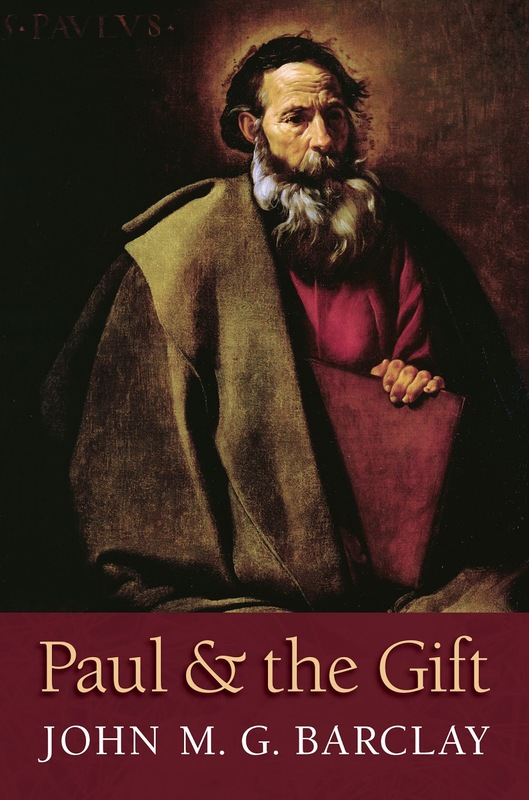 Writes Barclay (p. 569): "The incongruity of grace does not imply, for Paul, ... its non-circularity (since the gift carries expectations for obedience)." [T]he notion of a gift "with no strings attached" was practically unimaginable in antiquity...None of Paul's hearers would have been surprised to learn that as recipients of the divine gift they were placed under obligation to God. For Paul, grace creates a covenantal bond, and covenantal bonds were most definitely circular and reciprocal. Think of the relationship between YHWH and Israel. Think about how Paul, after describing the gift of grace in the first part of his letters, turns to the big THEREFORE in the second half, the part where Paul shifts to behavioral imperatives. Grace obligates you. No, in the sense that grace--God's election--is what establishes the covenantal bond. God's election poured out upon the unworthy is 100% God's work and initiative. Truly, we didn't deserve it and we were incapable of making contact with God. And if you don't fulfill those obligations, if you spurn grace and grieve the Holy Spirit, you drop out of the family. You "fall from grace." Barclay notes that, because of the church historical debates we've inherited about "faith vs. works", we find this mixture in Paul to be paradoxical. But as Barclay noted in the quote above, the incongruity of grace does not imply its non-circularity. Paul thus combines two features that appear paradoxical only to us. On the one hand, he perfects the incongruity of the gift, its donation to those unfitting to be its recipients; on the other, he presumes its strongly obligating character...Here it is crucial to remind ourselves that a perfection of gift in one dimension does not entail a perfection in every other: Paul perfects the incongruity of the gift (given to the unworthy) but he does not perfect its non-circularity (expecting nothing in return). The divine gift in Christ was unconditioned (based on no prior conditions) but it is not unconditional (carrying no subsequent demands). Grace is unconditioned, but not unconditional.